Don’t let the warm weekends pass you by, load that boat up and hit the water! You have everything you need for a perfect day out—don’t let not knowing how to load a boat stop you from having a great time. Getting your boat onto the water has never been easier! Loading a boat doesn’t have to be difficult. In fact you have two very convenient options to store and transport your boat; boat trailers and boat loaders. Each option has its own benefits and you can read more about that here. A boat loader is one of the easiest ways to load and transport your tinnie. The lightweight construction and robust properties make it the perfect all-round option for casual caravan travellers, weekend fisherman and serious four-wheel drivers. Why are boat loaders the preferred choice? One-person operation: boat loaders are incredibly easy to use as they require little to no effort loading and unloading the dinghy from the car. With the use of a 12V electric winch, you can do it easily and safely with just one person and a handheld remote control in a matter of minutes! Lightweight: the aluminium construction means it is durable yet lightweight. Thanks to its streamlined design, it is the perfect choice to transport your boat. Leave nothing behind: unlike boat trailers, you have the option to tow your caravan or camper trailer in addition to taking your boat. A boat loader also means you aren’t restricted to good roads and can take the adventure track if you want. Everything you need: boat loaders do not require any additional roof racks because they have been purpose-built to suit your boating and transportation needs. Forget arguing with your spouse about what to do next or struggling to lift your boat alone, let the boat loader do the hard work. If you want a boat loader that is going to take the pain out of bringing your tinnie with you, a rear boat loader is your best option! Fit the H Rack between the stern of the boat and your tow bar. Attach the ropes to the anchor points and ensure they are secure. Turn on the winch and guide the boat to make sure it is positioned correctly. You will have full control of the boat’s movement; you can stop and start the winch as needed without the worry your boat will come off. It will be held firmly in place from start to finish. You will notice that when loading the boat, it pivots from vertical to horizontal. It does this on the rear bar of the rack and gently moves forward until the bow is resting against the front edge of the rack. Don’t worry about the ropes, they will continue to pull tight until tension is sufficient to secure boat onto the loader. It is recommended additional tie-down straps are used for extra safety when taking a journey through rougher terrain. Simply reverse the loading process. When your day out on the water comes to an end, the boat loader is also convenient for cleaning. While the tinnie is loaded in the vertical position, stop the winch and hose off all the salt water. This will decrease the risk of rust and damage to your car. Boat loaders reduce the amount of heavy lifting and back breaking required to get your boat onto the roof of your car. This is why boat loaders are so popular. Take action and learn how to load a boat so you can make the most of summer! 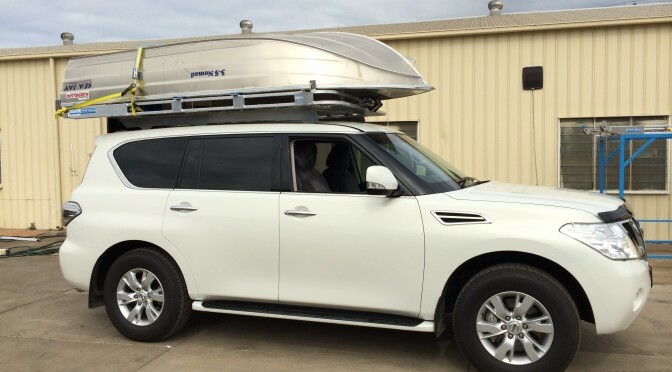 Contact the expert team at Almac Trailers on (07) 4152 3737 to discuss how to load a boat and what option is best for you!